In this lecture you will find all the needed information to satisfy your curiosity on how to implement line detection with your C# camera application using the Ozeki Camera SDK. First of all, OZEKI Camera SDK has to be installed and a reference to OzekiSDK.dll has to be added to your Visual Studio project. The line detection function indicates when an object in view crosses any (virtual) lines in any directions. For detecting corners we can use the ILineDetector object of the Ozeki Camera SDK. After an instance has been created with the help of the static ImageProcesserFactory class we can detect on frames and on video as well. No actions are executed on the input frames they are simply forwarded by default. However, the objects which implement the IImageProcesser interface (for example the ILineDetector) can be added with the help of the AddProcesser() method. More instance can be added which implement IImageProcesser, they will run one after the other using the image which is before them in the list. The initialization of the global variables is the task of the Init() method. The instance of the FrameCapture mediahandler are set here and the ILineDetector instance is also created here with the help of the ImageProcesserFactory. This also can be added to the ImageProcesserHandler instance. The processing of all images is indicated by the DetectionOccured event of the ILineDetector instance. Here we can subscribe to this event. After all image/frame processing a DetectionOccurred event is popped up. In the arguments of this event you can find the list of detected lines where the centers/radius and area of the lines can be queried. With the help of this lecture you can successfully implement line detection with your C# camera application using the Ozeki Camera SDK. After examining this article you will have the needed information to be able to benefit from the line detection function on the fields of the different fields of analytics. Who can test the line detection function of the Ozeki Camera SDK? Anybody can test and use this function, it does not require expert skills. If you are interested in this topic all you have to do is to try our product and benefit from the advantages of line detection function. On what operating system can I use the line detection function of the Ozeki Camera SDK? You can use line detection on all Windows OS platforms. Can I use line detection in a "moving" environment, for example for examining items which are placed on a belt? 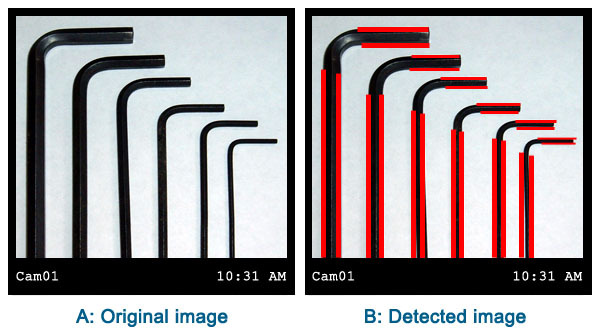 Yes, the line detection function of the Ozeki Camera SDK enables you to examine tools and items which are placed on a belt, the lines will be detected successfully.